Reminiscent of On Mystic Lake by Kristin Hannah, readers will adore Emily Colin’s unique and beautifully written debut novel, where one man’s promise to return drives an exquisitely passionate, unforgettable tale of love lost and found. When Madeleine Kimble’s husband Aiden dies in a mountain climbing accident, Maddie can only think of his earnest promise to return to her and their young son. Aiden’s best friend J.C. feels great remorse over his inability to save him, but J.C.’s grief is also seasoned with the guilt of loving Maddie through the years. Meanwhile, across the country another young man wakes up in a hospital and finds that his memories have been wiped clean, and replaced with haunting dreams of a beautiful woman and a five year old boy whom he feels driven to find. What Nicholas Sullivan discovers upon his journey is utterly unexpected—and it will change all of their lives, especially Maddie’s. 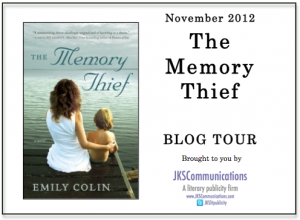 Emily Colin shattered my assumptions about The Memory Thief from the very first sentence. This novel is more than a romance with a little tragedy to shake up the plot. Colin builds the lives of these characters with such finesse and detail that feels so real I'm starting to wonder whether the story is really an adaptation of a real life experience! 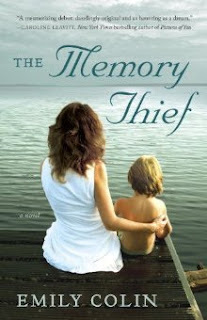 The Memory Thief is captivatingly written, taking perspectives from three key characters and connecting them throughout the novel with grace and continuity. Aidan and Maddie have a bittersweet history that makes getting to know them a roller coaster ride of emotions: love, joy, grief and more feelings I couldn't begin to describe. Their story also has a complicated twist involving Aidan's best friend, J.C. J.C. proves to be a rock for Maddie when Aidan doesn't return from their big mountain climb, and to my perspective his presence was heartbreaking and hopeful all at once. His role in The Memory Thief is just one of the things that brought many tears to my eyes because he had his own issues in dealing with Aidan's loss, yet he put Maddie and her son, Gabe, before himself. The family dynamic between Aidan, Maddie and Gabe was adorable. I love that Colin gave little Gabe an unforgettable role in the plot. His occurrence, along with a couple of other characters, gave this novel a positive vibe that could have been focused with darkness and grief, instead. Gabe was one of the spearheads that helped move this story along very imperceptibly. Another spearhead was Nicholas Sullivan, who's perspective readers will find quite enjoyable and inspiring. Nicholas' life changed as he awakened from an accident to find that he can't remember anything about himself, except for his name. While trying to place the pieces of his life back together he realizes that the memories of a woman and child and mountain climbing are the keys to the answers he seeks. I had no idea where Colin would take Nicholas's side of the story but I am thoroughly impressed with where it led. I didn't anticipate the turns that Nicholas brought about in the story, but it made me smile to see the resolution Colin employed to keep this part of the story as realistic as possible. Through all the tears and grief and anger the characters felt, I felt a strong thread of suspense keeping me glued to the pages. While I was able to see from every side of the story, I never felt as though I was waiting for the characters to play catch-up. Colin's pacing is fluid and keeps the story engaging for readers so they'll never feel lost or a loss of interest. The Memory Thief is a contemporary novel with just a dash of mysticism, but I didn't finish the novel focused solely on the impossible events. Emily Colin didn't let the powerful love story become overshadowed or watered down by the surrounding events and actions. The beauty in her words and characters gives one much to think about, but the story doesn't loose its ability to entertain. The Memory Thief will affect me for many years to come, and I certainly hope Colin will pen another hit soon! In the beginning—before I put pen to paper or fingers to keys—there exists what I like to think of as Ideal Book. Ideal Book is a thing of beauty. It’s brilliant and witty, engrossing and suspenseful, with a flawless plot that keeps readers up until the wee hours of the morning and characters so real that you can feel them sitting next to you, obligingly turning the pages. Destined to win critical praise and grassroots support alike, Ideal Book is an unpretentious classic whose prose sings with the unapologetic power of Aretha Franklin and the visceral sexiness of Steven Tyler. In a word, Ideal Book is—as its name suggests—perfect. And is the case with most perfection, it is also an illusion. When I write, I do my best to recreate what I see so well in my imagination. I fall in love with my ideas, with the possibilities that they imply—and, as the cliché goes, so often love is blind. It’s hard to realize that, sometimes, what I’ve put down on paper doesn’t reflect the vision that I see in my mind’s eye—that, like my seven-year-son’s helmet, my work is far from perfect—even if writing is my best thing. Each time I sit down to write is an act of faith—that I won’t let the blank page intimidate me, that I’ll be able to pull the proverbial rabbit out of the hat again, conjuring words from thin air. That even though I know my work will fall short of perfection, I’ll hold Ideal Book in my imagination, not with despair or contempt but with an unfailing sense of hope. That even though the book may not take the direction I expected—though I may wander off the beaten path for so long that I doubt I’ll ever find my way back home—I’ll discover something curious and beautiful along the way. This is how I wrote The Memory Thief, which I revised and restructured and revised some more until I thought I might have destroyed the book entirely. I hadn’t, as it turned out. Oh, the book I originally wrote is gone, this much is true. I burnt that baby to the ground, in a deliberate act of arson. And it hurt me to watch it burn, like I’d taken a match to Ideal Book in all its naïve and spellbinding glory. But from the ashes rose the creation that became the finished novel, the one Random House believed in enough to publish. No, the story wasn’t quite what I’d originally envisioned, back when it was just me and Ideal Book, sitting in a coffee shop in the moments before I turned on my old laptop and typed the words that would begin The Memory Thief—the ones that fell to the cutting-room floor long before the manuscript found its way to print: “The dream was always the same.” It was better than that, imperfections and all … because it was real. Thank you so much, Emily, for stopping by and sharing about your 'Ideal Book'. I'm sure many aspiring authors will appreciate your experience! EMILY COLIN is the Associate Director of the DREAMS Center For Arts Education, a nationally award-winning nonprofit dedicated to building creative, committed citizens through high-quality arts programming. Prior to DREAMS, she served as Editor-in-Chief of Coastal Carolina Press, and co-founder of Carolina Women’s Partnership. 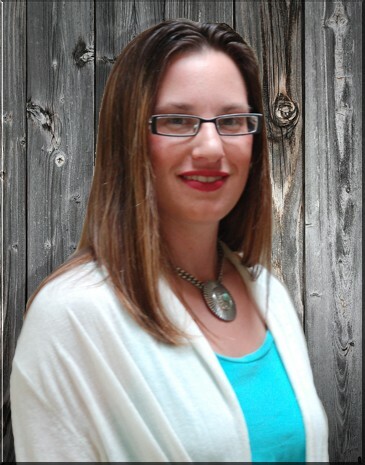 She also works closely with the North Carolina Arts Council. In Though Colin is not a mountain climber—she’s actually afraid of heights—she spent innumerable hours doing research for THE MEMORY THIEF: shadowing Outward Bound instructors as they scaled cliffs in Colorado’s Rifle Canyon, conducting reconnaissance missions in an indoor rock-climbing gym closer to home, and speaking with alpinists who took on Alaska’s Mt. McKinley—and lost. For more information, please visit the author’s website at www.emilycolin.com. I think the ideal book for everyone is different. Some people like long books with a lot of detail while others like short and to the point. I personally prefer the middle. Not too short and not too long with just enough detail to help me put the picture together in my mind without weighing down the flow of the book. Also something that keeps me turning the pages without wanting to put them down for even a minute. This sounds like one of those books and I can't wait to read it. Thank you so much for the wonderful guest post and giveaway! I like stories that are about 350 pages. You can get all the info in that amount. Anything longer and I get bored. Thanks for giveaway.